File photo of Minister Eoghan Murphy. THERE ARE NOW just under 10,000 homeless adults and children living in state-funded emergency accommodation across the country, latest figures reveal. The homeless emergency accommodation figures for January show that there are now a combined total of 9,987 people homeless and living in emergency accommodation in Ireland, a significant rise of 234 people from December. The numbers taken over the course of one week in January show that there were 6,363 adults and 3,624 homeless children living in emergency accommodation in the state. This is an increase of 169 adults and 65 children, bringing the combined total to just 13 under the symbolic figure of 10,000 people. The number of families homeless in Ireland has dropped by three to 1,614. 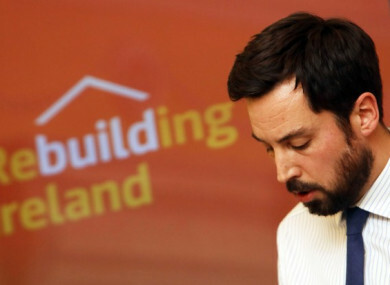 Commenting on the figures, Housing Minister Eoghan Murphy said in a statement that the rise was “very disappointing”. “It is very disappointing and we remain in a very difficult situation where homelessness is heavily impacting on the lives of families and individuals,” he said. There was a decrease of people in emergency accommodation in December, which we understood at the time to be partly due to seasonal reasons, and so an increase in January was anticipated but that doesn’t mean it is acceptable. The minister went on to say that government was seeing “some very positive movements when it comes to families in emergency accommodation”. In relation to the families, Murphy said that over the past two months people working in homelessness services had exited more families from homelessness and into tenancies than have entered emergency accommodation. “Families in emergency accommodation are at their lowest point for a year,” the minister said. If these movements can be sustained as trends in 2019 then we will make important inroads into the crisis this year. The Housing Department said that a total of 97 families exited emergency accommodation to an independent tenancy in Dublin in January, while a further 96 families were prevented from entering homelessness. Despite a small reduction in the number of homeless families, the number of children homeless rose last month by 65. In Dublin – where the problem is at its worst – the number of homeless children increased by 20. The number of homeless families living in commercial hotels in Dublin decreased by 32 – from 703 in December to 671 in January. The government has come in for criticism from non-governmental organisations and opposition figures for the latest rise in homeless numbers. Merchants Quay Ireland, the national homeless and addiction charity, said that the latest homeless statistics represent an ongoing national trauma. “Homelessness and addiction are combining with devastating effects,” said CEO Paula Byrne. “The latest homeless statistics show that Ireland is experiencing its biggest social crisis in generations. The high level of homelessness, as shown in today’s figures, coupled with Ireland’s ongoing drug epidemic, is causing a deep and widespread trauma. Anthony Flynn – CEO of Inner City Helping Homeless – said “enough is enough” and called for the establishment of a task force on homelessness. Solidarity TD Mick Barry said that “any government which allows homelessness to touch the 10,000 mark does not deserve to remain in power”. Labour’s housing spokesperson Jan O’Sullivan said that the figures pointed to “how unfit for purpose” Rebuilding Ireland – the government’s Housing Action Plan – had become. “This happens on an annual basis, and it shows that the same patterns are not being recognised by the government and not being addressed,” she said. How many more times will these numbers go up before the Minister takes action? O’Sullivan called for better protections for people living in the private rental market as a means of easing the number of people coming into homelessness. Meanwhile, Sinn Féin spokesperson Eoin Ó Broin said that figures showed that “Rebuilding Ireland is failing and will continue to fail”. “The Minister has called the figures disappointing. This is deeply insulting to all those people left homeless as a result of his failures. Today’s figures are an outrage,” Ó Broin said. He called for Murphy resignation and said the government should scrap Rebuilding Ireland. In his statement, Minister Murphy also pointed towards an increase in the social housing stock in the country last year and increased building as a means to tackle the homelessness crisis. Email “'A national trauma': There are now 9,987 people living in homeless accommodation in Ireland ”. Feedback on “'A national trauma': There are now 9,987 people living in homeless accommodation in Ireland ”.